Greetings again from the darkness. Director Wim Wenders has had a varied and diverse career dating back 50 years with both narrative and documentary films. He is probably best known for PARIS TEXAS (1984), WINGS OF DESIRE (1987), and PINA (2011). As a filmmaker, he seems to excel at finding a slightly different way of looking at a subject or topic, and because of this, some of his projects are better received than others. This time out he is granted remarkable one-on-one access to Pope Francis, as well as some terrific archival footage obtained from the Vatican. Jorge Mario Bergoglio from Buenos Aires, Argentina became Pope in 2013, and he chose Francis as his papal name. Director Wenders spends much of the movie making the connection and correlation to his namesake St Francis of Assisi – some 800 years ago. Wenders’ artistic flair comes through in the black and white dramatization sequences, which are meant to send us back to the time of Assisi so we can grasp the parallels. This is no sales pitch for Catholicism, but rather an introduction to the man, his vision and approach. It seems clear that this “reformer” is what was needed after the ultra-conservative Pope Benedict “retired” (an unprecedented step). Rather than harp on the prior missteps, the film focuses on this most engaging and sincere man who is devoted to the causes of poverty and immigrant rights. He believes we should follow the Law of Nature: we should all live in harmony; and that we are all responsible for the world and community in which we live. Pope Francis tells us of his 3 T’s: terra (land), trabajo (work), and techo (housing), and how those are the foundation of a future named “hope”. Beyond those elements, this is no sound bite film. It is quite humbling to listen to a man so universal in thought. He has zero tolerance for pedophilia inside the church or out, and he firmly believes in the rewards of listening – yet another dot Wenders tries to connect with St Francis of Assisi. The camera (and hence, us) travels the globe with the Pope – Africa, Brazil, Greece, the United States, Israel and more. So many countries, religions and races are touched. He even symbolically washes the feet of the less fortunate. 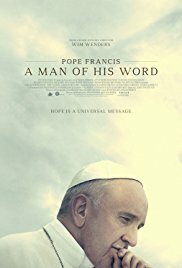 There is a good deal of talking head interviews with the Pope himself, and he never shies away from a question … leading us to the single criticism of the film. Wenders, acting here as narrator and facilitator, simply doesn’t push hard enough on some of the difficult topics that could lead to real insight and debate. So we are left to ponder if this wonderful man can mitigate change within a Church that is not much known for it (check out the demographics of the group of Cardinals Francis addresses). Wenders delivers an affectionate glimpse of the man, and we leave with a bit more admiration and hope – not such a bad thing. This entry was posted on Friday, May 18th, 2018 at 5:57 pm and is filed under Documentary. You can follow any responses to this entry through the RSS 2.0 feed. You can leave a response, or trackback from your own site.